The Orange had an answer for a 24-5 first-half Florida State run, but nothing for Mfiondu Kabengele. Clinging to a three point lead with 9:06 remaining, Leonard Hamilton signaled timeout and FSU turned to its leading scorer Mfiondu Kabengele for relief against a maddening Syracuse Orange charge that began late in the first half. Kabengele tipped in a missed three by PJ Savoy, splashed a three of his own on the left wing and Terrance Forrest stripped Elijah Hughes to set up Mann for two. In under two minutes, Florida St. led by 10 after the Orange drew within two nearly 16 minutes after 21. During two double-digit runs in the first and second half, Kabengele took over the game with his screening, shooting and mobility at the center position. Syracuse drew within one basket after trailing by 21 in the first half, but never took the lead during their comeback attempt in a 80-62 loss to the Seminoles on Tuesday night. The numbers initially painted a picture of two similar teams that both kept their opponents out of the paint with stingy interior defense. 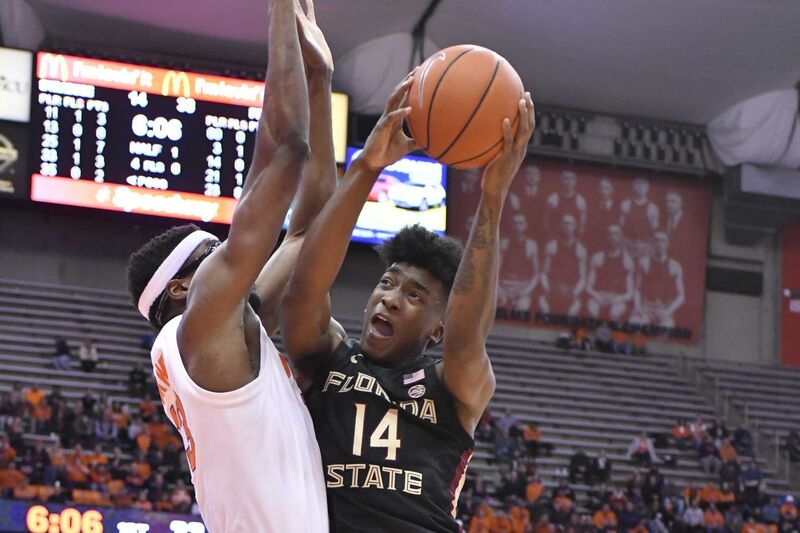 Their defensive strengths mirrored each other, but it was harder to predict that Florida State (24-5) and Syracuse (19-6) would trade near-identical first-half runs on nearly the exact (11-10) number of turnovers. Syracuse held an early advantage in circumventing the FSU interior defense. Then watched everything shatter. Tyus Battle hit three shots in the in-between area to deflect an early pair of MJ Walker threes. SU moved the ball inside, then out to Hughes to generate two open three-point looks. Paschal Chukwu even forced a turnover on a past inside to Christ Koumadge, a rare opponent who is taller than him. The Orange built an early 7-6 lead. Out of the first timeout, SU’s edge cracked and disappeared in rapid succession. Florida State flexed their shooting and transition game, embarking on a massive run that pushed the team ahead by over 20 points with 7:00 remaining in the first half. Kabengele tilted the scale with his mobility and shooting. He splashed two threes and added a cutting layup to provide an 8-point boost off the Seminole’s bench. Savoy finished the FSU push with a three-point and-one on the right wing, and Jim Boeheim thrust Jalen Carey into action. Carey quickly turned the ball over Raiquan Gray, who scored inside, and within moments the Orange faced its biggest deficit at 33-12. The Orange did. Battle hit two quick shots, Oshae Brissett burst to the rim for a three-point play and built the groundwork for a thrilling run that sent the Carrier Dome into a frenzy and pulled SU within eight at halftime. But the run momentarily halted at 4:13. The refs granted a timeout to Boeheim seconds before the four-minute media timeout, and not the coach. Jim, already frustrated with the referees for much of the first half, dug into the referees for nearly the entirety of the timeout they granted his son. Out of it, Buddy splashed a quick two to keep the run moving. Hughes, injured earlier in the game moments before FSU’s giant run, hit his first three since Syracuse’s early lead, and Battle traded another with Mann. Brissett, who stole three balls from the Seminoles during that run, propelled the Orange’s momentum into the second half with an elbow jumper and another three-point play at the rim to make it 42-36. Battle pulled Syracuse two points closer with a strip and score on Walker in transition. Boeheim inserted Boeheim (still weird to say) with 17:30 left in the second half after a Frank Howard turnover in the wrong place, right in front of the coach’s bench. He’d play for nearly the following eight minutes and contributed a layup to the comeback. Brissett’s scorching run continued with a kick out from the post to Hughes for three, then an offensive rebound, quick dribble into position and layup. FSU maintained their lead all the way through though, shooting 52.9 percent outside nearly 30 minutes in. Savoy hit his second off the Seminoles bench to quiet the Orange run, then Mann charged to the rim for four straight points. Marek Dolezaj stopped the bleeding with Syracuse’s ninth offensive rebound, and dished to Hughes for three free throws. He hit them all. Pulling as close as two, Syracuse never provided the thrilling finish as the Dome emptied with over two minutes left and Florida St. ahead 76-60. Out of Hamilton’s timeout, Kabengele contributed eight to FSU’s 10-0 run and ripped the game back to double digits from that point on. He finished with 18 points, perfect 4-for-4 three-point shooting, seven rebounds and a pair of blocks in a performance that dictated the pace of the game during his run of minutes. The Orange play next at the Carrier Dome on Saturday at 2 p.m. against Boston College.